Compact and stylish, the cool black Toshiba Tec EP range of 2 and 4 inch portable thermal printers is the ultimate in wireless functionality and reliability on the move. The EP range of portable printers link seamlessly with handheld devices to provide a robust yet lightweight portable printing solution. 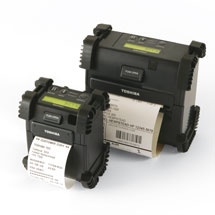 Drop in media loading and flexible connectivity options ensure the EP range is the answer to retail, warehousing/logistics, field service, healthcare and public service printing applications.